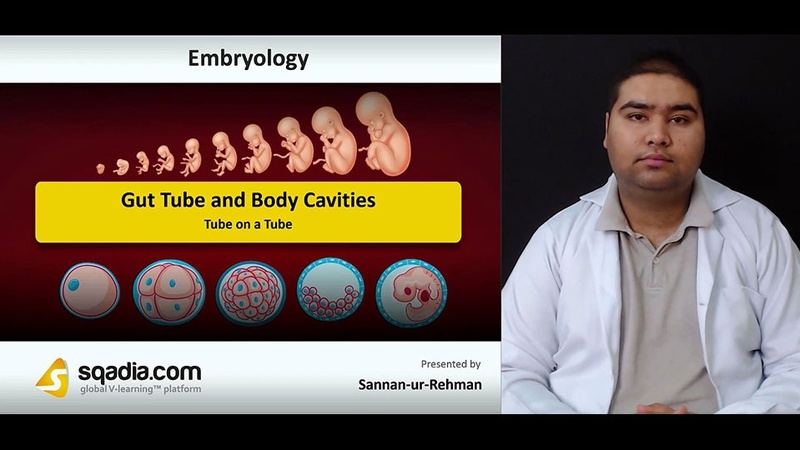 This following lecture focuses on a thorough elucidation of Gut Tube and Body Cavities. Section one of this lecture is devoted to the explanation of concept Tube on a Tube. The educator begins by giving a comprehensive overview of Neurulation. After this, an explanation regarding Formation of Gut Tube is put forth followed by a demonstration of Splitting of Intraembryonic Mesoderm. Section two is about Formation of Body Cavity. In the start, the educator highlights Splitting of Lateral Plate Mesoderm. Moving forward, light is shed on Primitive Body Cavity and Ventral Body Wall. In the end, the educator reports Vitelline Duct and explains it thoroughly. Section three refers to the topic of Serous Membranes. In this section, the educator starts off by speaking extensively about Parietal Layer and Visceral Layer. Following this, Dorsal Mesentery and Ventral Mesentery are elucidated in detail. Section four primarily brings under consideration the Clinical Correlates. In this section, the educator extensively talks about Ventral Body Wall Defects which include Ectopia Cordis, Gastroschisis, Bladder Exstrophy and Cloacal Exstrophy. Moreover, the educator also sheds light on Omphalocele Vs Gastroschisis. In section five, the educator speaks about Diaphragm and Thoracic Cavity. A comprehensive overview of Septum Transversum is presented after which information is given regarding The Thoracic Cavity. Moving forward, the educator highlights Formation of Diaphragm in detail and covers the topic of Diaphragmatic Hernias.